If you’ve read this column the past few weeks, you may already have guessed this week’s Triple-Option Offense Play of the Week. Yes, that’s right. It’s SB John Trainor’s 8-yard run off a left-handed pitch late in the 4th quarter last year, setting up the go-ahead score. Recall the situation. Army scored on the opening drive but could get little done on offense afterward. Three straight punts saw the Black Knights down 10-7 at the half. Another Navy field goal made it 13-7 early in the 3rd quarter. Army finally started getting some push on the next drive, but a false start penalty on 3rd-and-8 deep in Navy territory followed by a negative yardage pitch play led to a missed field goal. 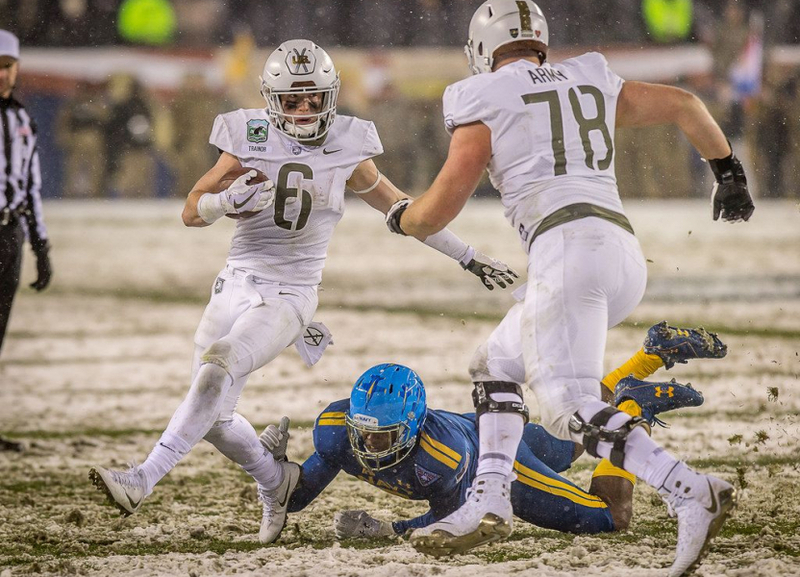 Army’s defense forced a three-and-out, but now the Black Knights were running out of time, and their offense had not moved the ball with legitimate consistency since the opening drive. Things changed as we got into the meat of the 4th quarter. QB Ahmad Bradshaw ran hard behind T Brett Toth three times, and that opened up the Fullback Dive, at last getting Army’s offense back on track. 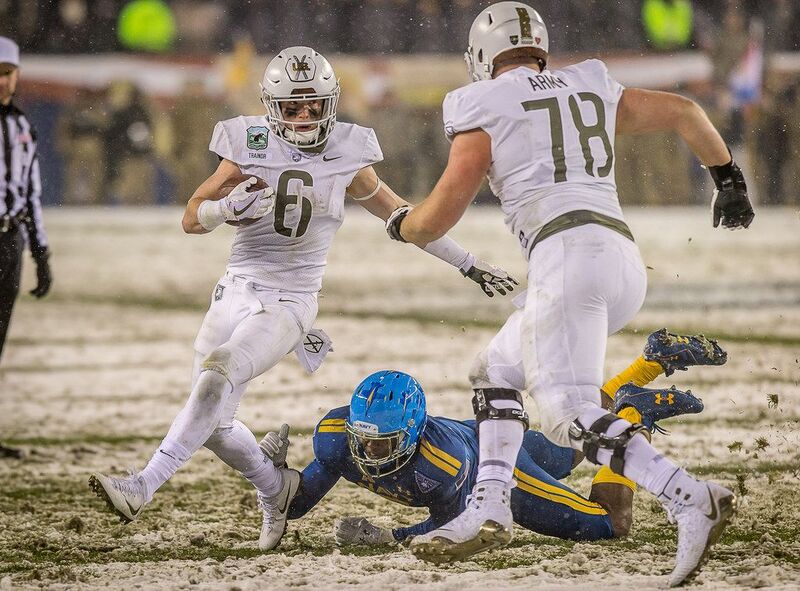 A steady diet of Midline Options took Army to the Navy 9, but then Navy stiffened. The Mids stuffed a QB Keeper on 1st down, setting up 2nd-and-goal from the 9-yard line. Down six with less that 6:00 to play, Army could ill afford to attempt another field goal. What’s interesting about this is that it’s a rare Midline Triple-Option coming directly off the success that previous Midline plays had seen earlier in the series. Where Navy runs more of an outside speed-option based around the quarterback/slotback pitch, Army tends to run inside (along the midline) with the primary option being quarterback/fullback. On this play, it looks like the Defensive Tackle is optioned since he flies right past the Guard, but he gets on Bradshaw so fast that he almost blows up the play before it has a chance to develop. In fact, Bradshaw probably could have handed to the Fullback, but Army needed nine yards, which is kind of a lot for a Fullback Dive. And anyway, with the way this was blocked, it looks like it was always headed outside to the left. Also, the staff for sure didn’t draw it up as a left-handed pitch. But with a defender on him, Bradshaw just gets the pitch off, and somehow Trainor (the trailing slotback) fields it cleanly in-stride. Now Trainor’s got open field, a half-step, and a blocker (Kell Walker, the leading slotback) out in front. Navy’s defense reacts pretty well, but Trainor evades a diving tackle, turns the corner and gets all the way down to the Navy 1-yard line. Bradshaw powers it in on the next play. Army doesn’t run the Midline Triple-Option particularly often, probably because the play starts with the slotback 7 or 8 yards behind the line-of-scrimmage. We know how much this coaching staff tries to minimize potential negative yardage plays. However, we saw Calen Holt score a touchdown on a similar midline pitch a few weeks from the slot, and if you go back and watch some of Coach Monken’s old Georgia Southern highlights from when he had Jet McKinnon in the slot, you’ll see this play bunch. It’s particularly good if the defense is getting penetration at the line of scrimmage (Georgia Southern used it against Alabama, for example), but it relies on speed from the slotback. The slotback has to turn the corner and get upfield, or this can turn into a disaster. My other favorite things this week come from a Football Outsiders. The first is an article covering the Baltimore Ravens’ use of QB Lamar Jackson. In particular, there’s a discussion in the middle of the article about running Quarterback Power out of a “diamond” formation. We haven’t seen that overmuch with QB Kelvin Hopkins under center, but the Black Knights ran it a ton with Bradshaw, and they tend to run it when QB Cam Thomas comes into the game as well. The whole article is about the Ravens’ coaching staff suiting their offense to their quarterback’s talents, and in that, it applies to Army, too. Later in the Cincinnati game, the Ravens doubled down on their heavy-personnel pistol formations with a “diamond” look in a third-and-short situation. Pistol diamond, or “full house,” puts one running back behind the quarterback with two other running backs, tight ends, or H-backs on either side of him, creating the diamond alignment. This formation is specifically great in short-yardage situations because the abundance of players throughout the backfield presents the defense with a handful of potentially moving blockers and run gaps. I have been dabbling recently with yet another modified version of the FEI ratings, one that gives more pronounced weight to more recent results. The idea that a team may dramatically improve or decline over the course of a season is something that I have intended to consider, but I have had trouble with modeling this, in large part due to the small number of games played in college football. And especially since a significant portion of the well-connected non-conference games are scheduled early in the year, it is challenging to have a recency-weighted model reflect both the changes in team performance and a solid footing on which to apply opponent-adjustments. This stuff may well impact Army’s aggregated S&P+ rankings over the course of next season if they can get it wired. Which isn’t exactly important, but like I said, I know it drives Rob crazy, so here we are. We’ll talk about this more in the offseason.